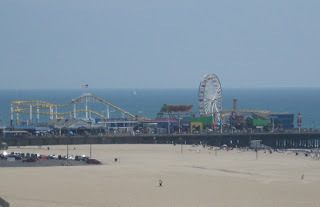 There is a terrific "boardwalk" connecting Venice Beach with Santa Monica. It's a cement trail, not the traditional wooden boardwalks we Yankees recall from the Jersey shore - ahhhh remember Wildwood back in the day??!! -- but this cement trail is excellent for biking. Leaving Venice and heading north, you'll see the workout area that gave muscle beach it's fame and you'll probably see some guys working out. I, being profoundly unfit at this time of my life, took my car & skipped the bike. 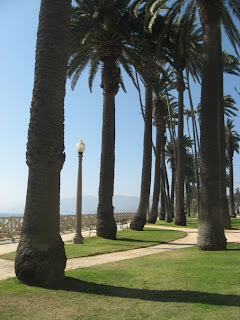 The three places I wanted to hit in Santa Monica were the Pier, 3rd Street Promenade & the trail overlooking the PCH and the beach. 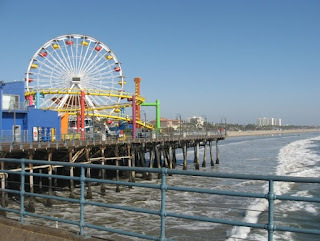 Here's the Santa Monica Pier to your right. It's kind of small, but definitely worth checking out. I was told it is the best place to be for sunset and that proved very true. It had the usual kitschy stuff, but I did notice some new kitsch. A cement bust. It's the new thing. You can get a cement bust of yourself made instead of a charcoal drawing or something. I so wanted to get one of me and put it in someone's Christmas stocking. I know it would get passed around different Christmas stockings each year. 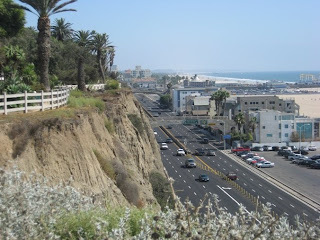 The view to the right is the PCH, a pinch north of the pier. The awesome trail is to the left of the white fence. It meanders along the cliff, providing some magnificent views and sunsets. I meandered about 5 blocks to the Starbucks for a beverage and brought it back to enjoy my walk, only to find my parking meter expired and no change in my pockets. Sometimes those spontaneous moments of perfection just don't happen. Here's a portion of the meandering trail. In my photo, you can barely get a glimpse of the mountains in the background, but in real life, the view is extraordinary. 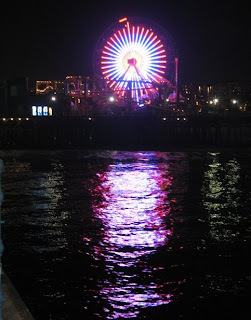 So I took the car nearly to Beverly Hills and picked up Tom S., fresh from his Gartner conference, full of exciting new IT info, and I brought him back to the Pier for supper. I dragged him to the very end of the pier to Mariasol, cocina mexicana. Jackpot! 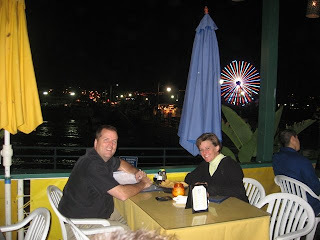 Outdoor seating, overlooking the lights of the ferris wheel and the Santa Monica shoreline, absolute perfection. I don't remember much about the food so I'm guessing it wasn't real good or real bad. I was drunk with ambiance. 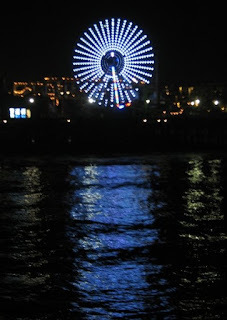 As we were leaving the pier, we watched the ferris wheel changing colors. How perfect is that?